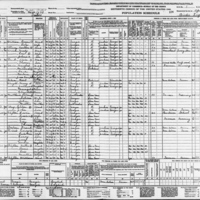 The U.S. Census population schedule for Militia District 1638 in Scarboro, Georgia, in 1940. Individuals are identified by name, titles and terms, gender, age, marital status, race, relationship to head of household, birthplace, birth year, the last place of residence, and occupation. A notable resident listed in this record is Private Hubert Cody Gibson (1921-1945). Pvt. Gibson was born on June 16, 1921, in Sandersville, Georgia, to Frank Elizah Gibson and Jeanette Buelah Brantley. Pvt. Gibson enlisted in the U.S. Army in Florida as a private in the 191st Tank Battalion Division. He was wounded in action while he was deployed in France, and on May 10, 1945, he passed away. According to a listing of deaths from Palm Beach County, Pvt. Gibson was listed as passing away due to the wounds that he received. Pvt. Gibson was awarded a Purple Heart for his heroics, and buried at the Epinal American Cemetery and Memorial in Dinozé, France. 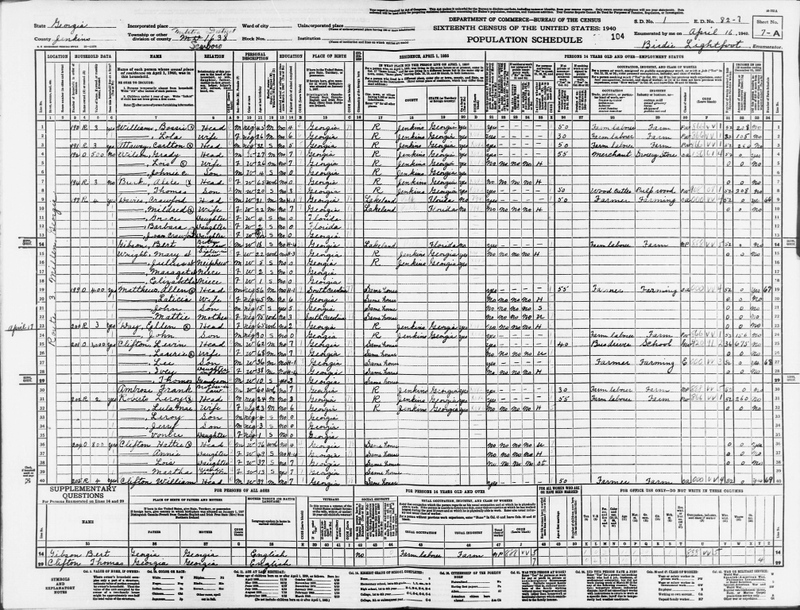 Digital reproduction of original census record by Birdie Lightfoot, April 16, 1940. https://familysearch.org/ark:/61903/1:1:K7GV-G93. Originally created by Birdie Lightfoot and published by the Bureau of the Census. "Pvt Hubert Cody Gibson." Find A Grave. http://www.findagrave.com/cgi-bin/fg.cgi?page=gr&GSln=Gibson&GSfn=Hubert&GSiman=1&GScid=1991677&GRid=56372546&. Lightfoot, Birdie. “Sixteenth Census Population Schedule for Scarboro, Militia District 1638, Georgia.” RICHES of Central Florida accessed April 24, 2019, https://richesmi.cah.ucf.edu/omeka/items/show/7000.